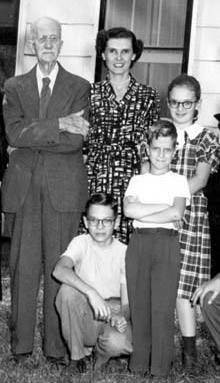 I really admired my grandfather, who was a doctor, pharmacist, hunter and gardener. I especially admired two of his nonprofessional skills - even when he was in his nineties he could put a razor edge on a knife, then use that knife to put a perfect point on a pencil. I learned to sharpen with hand stones at Grandpa's knee, but I always had trouble with certain knives. 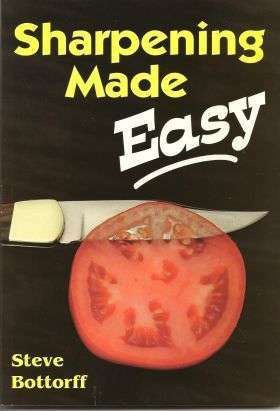 For years I searched for the ultimate knife sharpening method. I realized that I might not have the skills required so I was willing to use whatever gadgets and machines I could find. Testing over 30 different knife sharpeners taught me what works and what doesn't, and I decided to write this article and share the information. BTW: I gave up on sharpening a pencil with a knife and bought a pencil sharpener. The instructions that come with sharpening equipment is often inadequate. Some give no instruction at all. I note in this article when equipment comes with good instructions. There are two schools of knife sharpening - those who like a knife to keep some roughness from the stone and those who believe that it should be as smooth as possible. Both approaches have their benefits. Blades with a rough edge can be aggressive cutters, especially when the blade is thin. They have micro-serrations that act like a microscopic saw. These micro-saws are very well suited for slicing fibrous material, such as a rope. This edge is easy to produce because you just stop sharpening after a medium stone (200 to 300 grit). Blades sharpened this way do become dull faster as the points wear or bend, so frequent touch-ups are needed. Smooth edges are best for cutting with a straight push and are preferred by barbers, surgeons and woodworkers. Research done by John Juranitch of Razor Edge Systems (1) shows that butchers can cut more meat per shift and tire less when using a smooth edge. Analysis with an electron microscope (2) has confirmed that wood cutting ability is correlated to edge smoothness. Sharpening a smooth edge requires more work, but the results are worth it. To be sure you are improving your sharpening; you need an objective way to test the results. Tests evaluating sharpness range from cutting silk to chopping trees. What you need is a test method that are useful in your workshop as you are sharpening. 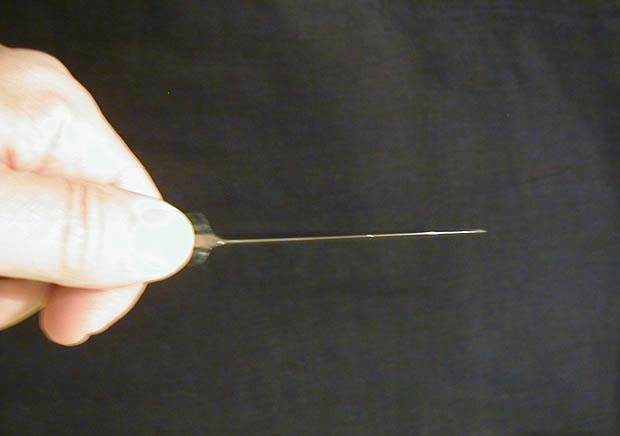 A major knife maker tests sharpness on nylon paint brushes. Most people test an edge by rubbing their thumb lightly across the edge and feeling how the edge grabs as it tries to cut into the thumb pad. 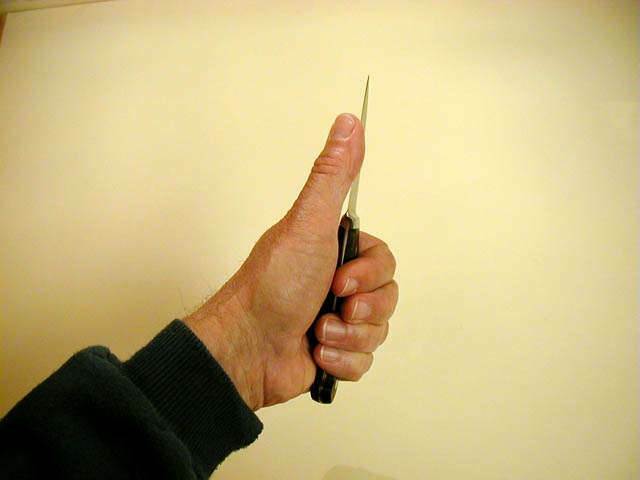 To keep your thumb calibrated, test a known sharp edge like a new razor blade periodically. Shaving hair on your hand or arm is another common sharpness test. Shaving sharpness can be achieved even on heavy hunting knives or an axe. I own a hunting knife that will shave even though the edge angle is a rather blunt 30 degrees. I use the term shaving sharp to describe this degree of sharpness and razor sharp to describe even greater sharpness. Razor sharpness is comparable to a razor blade and will literally pop the hairs off your hand or arm. Razor sharpness is only possible with both a polished edge and a small edge angle. Testing by shaving can be misleading if the blade has a burr or wire edge. Steel naturally forms a burr - a thin bendable projection on the edge - during the sharpening process. A blade with a burr will shave but will not stand up to hard use. To test for a burr, slide your fingertips lightly from the side of the blade over the edge. You will feel the burr drag against your fingers. Test from both sides, because burrs are usually bent over one way or the other. As your sharpening improves you will be looking for smaller and smaller burrs. The glint along this edge means a dull blade. Many good sharpeners, including my grandfather, have learned to see a dull edge. Hold the blade in front of you with the edge in line with a bright light. Move the blade around a bit. A dull edge will reflect a glint. Nicks and burrs will also cause glints. When the blade is sharp these glints will be gone. Then it occurred to me that this is how I see the old dull edge of knives and scissors even without magnification. A bright light is the secret, coupled with rolling the edge so you see every possible angle between your bevels. Any glint of light as you roll and you have found the dull spot. Eureka! Another test for sharpness is to press the edge lightly on your thumbnail at about a 30-degree angle. If it cuts into your nail it is sharp. If it slips it is dull. The sharper the blade, the smaller you can make the angle before it slips. Try this with a new razor blade to see how a really sharp blade feels. The down side of thumbnail testing is that the little cuts in your nail get dirty and look bad until the nail grows out. For this reason some people do this test using a plastic pen or pencil. No shop is complete without at least one bench stone, preferably two or more of different grits. I recommend you buy the largest sharpening stones you can afford. Stones for shop use should be as long as the longest knife you plan to sharpen. Remember that Momma probably owns the really big knives around the house, and you will be expected to sharpen her 8 or 10 inch butcher knives. Smaller stones are handy for field use. Large tool suppliers such as MSC or McMaster-Carr and restaurant suppliers are good sources for sharpening stones. Natural sharpening stones include both stones found in nature and reconstructed stones. The original Washita and Arkansas stones were quarried natural stones, but now many stones sold by these names are reconstructed. The abrasive material is novaculite, a mineral related to flint and quartz containing mainly silicon dioxide. The relative hardness of novaculite is 6.5 on Mohs scale, just a bit harder than file steel. The original Japanese and Greek waterstones were also from natural sources. Natural abrasives work well on carbon steel knives, but they struggle with harder tool steels and tougher wear-resistant and stainless steels. For modern steels I recommend stones made with manufactured abrasives and industrial diamonds. Aluminum oxide, which has a relative hardness of 9.2, is also bonded to form reconstructed stones, including modern Japanese water stones (resin bond) and India stones (vitrified bond). Originally this material was from natural sources (emery and corundum), but manufactured abrasives have dominated since the early 1900s. Ceramic stones are made from alumina (aluminum oxide) or silicon carbide in a ceramic bond. Silicon carbide has a hardness of 9.5 and will sharpen anything except carbide tipped tool bits. Spyderco and others offer ceramic stones in a wide variety of sizes and grits. Industrial diamonds are made into hones by bonding them to steel and are therefore also called diamond files. Diamond has a relative hardness of 10. Two very different types of diamonds are used in diamond hones. Monocrystalline diamond hones last longer because the diamonds do not fracture readily. Polycrystalline diamond is less expensive. Diamond hones are made by DMT, Eze-Lap and others. DMT uses monocrystalline diamonds. EdgeCraft's unique answer to bench stones is the Chef'sChoice 400 series diamond file system. It consists of rather thin diamond hones that fit on a magnetic holder. It is a very good value. EdgeCraft has a good pamphlet on sharpening which you can request from the address at the end of this article. An inexpensive alternative to stones is silicon carbide sandpaper. A piece of silicon carbide (also called wet or dry) sandpaper glued to a wooden block will work as well as a stone. Wet or dry sandpaper on plate glass is popular with woodworkers for sharpening plane irons and chisels, and for flattening the sole of planes. This method is called Scary Sharp by those who promote it. 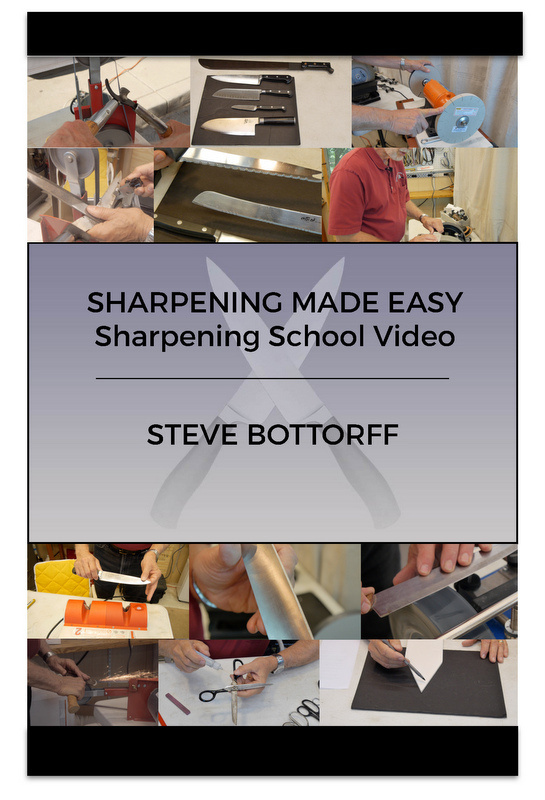 You will also need a guide to control the sharpening angle. 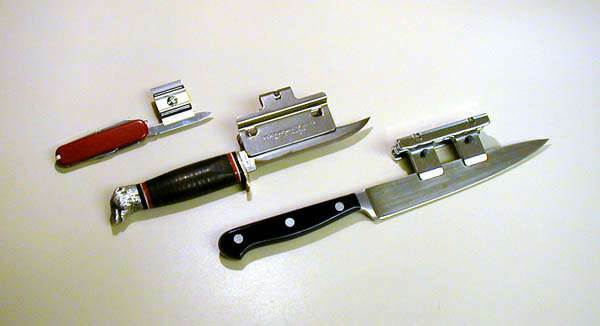 Guides are available for knives, chisels and plane irons. The drawback of most guides is that they waste about 3 inches of stone, so you would need a longer stone. If you mount your stone flush with your work surface, you can utilize the full stone length. The Razor Edge guide clamps on the blade with four Allen screws and I find it inconvenient to use. Also I managed to grind away some of this guide when I tried it on diamond hones. If you find a Buck HoneMaster, buy it. It is a good guide but no longer made. Unknown, Buck HoneMaster and Razor Edge guides. industry standard for years, with good reasons. Rod-guided systems have a rod on each stone that slides through a hole in the guide. This controls the angle and also prevents scratching the blade with the stone. Since the guide slides on the rod and not on the stone, a smaller stone is needed. Rod-guided systems sell in the $30 to $50 range, depending on the number and type of stones. A variety of stones are available, including ones for serrated blades. They will sharpen up to a 4 inch blade before you have to move the guide to a new position. Lansky, GATCO and DMT rod guided systems. 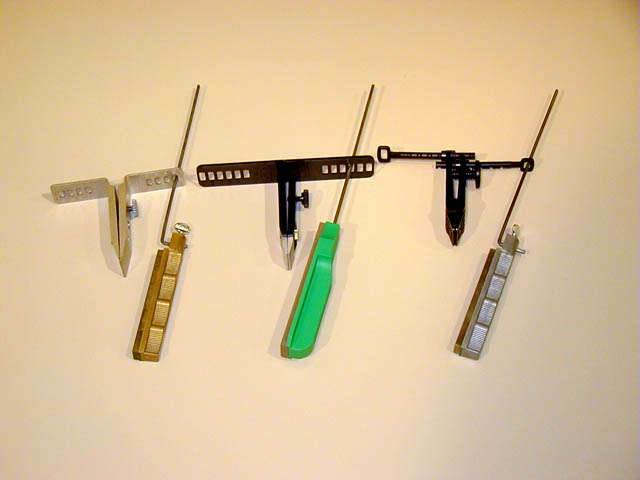 Rod-guided systems are available from Lansky, GATCO, DMT and others. The Lansky has an aluminum guide that goes from 13 to 25 degrees in 4 steps; each angle is 3 to 5 degrees lower than indicated. The GATCO guide is aluminum and reinforced plastic and goes from 17 to 34 degrees in 6 steps, each step is about 6 degrees greater than indicated. I prefer the GATCO to the Lansky because of the GATCO's larger stones and selection of angles. The DMT Aligner guide is all plastic, and goes from 12 to 35 degrees in 7 steps, which are not marked. With DMT diamond hones the Aligner would be the pick of the litter for this size of system. The class act in rod-guided systems are the EdgePro Sharpening Systems. Ben Dale, the owner of EdgePro, has spared no expense in his pursuit of excellence in hand sharpening. The smaller Apex is rugged and uses relatively large 1 x 6 inch aluminum oxide waterstones. The angle guide is continuously adjustable for any angle from 10 degrees to 35 degrees, with marks at 10, 15, 18, 21 and 25 degrees. My measurements confirmed that the marks were accurate. The larger Professional model uses the same stones and angles, but is more stable and also has a scissor sharpening attachment. Both units come with good instruction books.